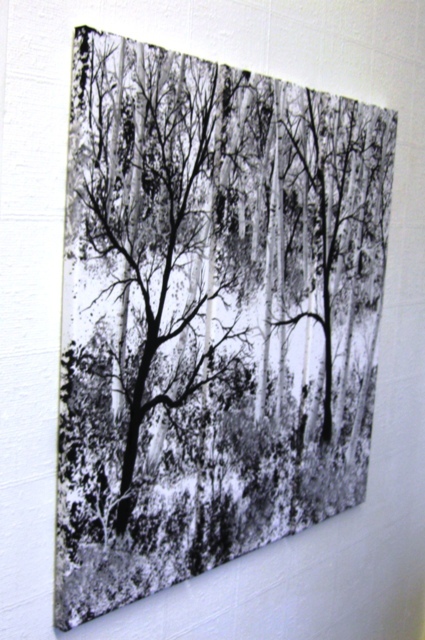 Description: A large 36 x 48 x 1.5 inches large contemporary landscape painting of two deer in a snowy birch tree forest. It is painted in semi abstract, art nouveau style with realistic deer contrasting against the abstract landscape. The trees are loosely based on aspen or birch trees and the perspective is arranged to make the deer look as if they both have their own path into the woods. They are arranged almost as a mirror image of each-other because to me that looks balanced. The paint is very thick in places and patterns can be seen forming in the snow if you look closely at it. It was inspired by a trip the British Wildlife Centre in Surrey where there are herds of of roe and red deer including a white stag. I always find deer enchanting and ethereal and in winter they are even more so as they can be spotted more easily than usual against the pristine white snow. However they can still vanish in the blink of an eye and mange to retain their mystery. Painted on deep edge canvas, white edges, no frame needed.